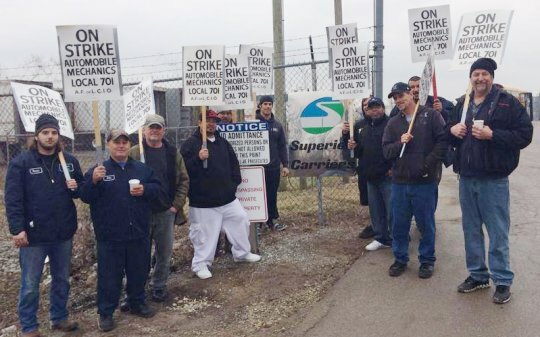 IAM Local 701 members at Superior Carriers in Markham, IL, voted unanimously to go on strike. Fighting high out-of-pocket health insurance costs and stagnant wages at Superior Carriers in Markham, IL, 13 members of IAM Local 701 said “enough is enough” and voted unanimously to strike on April 8, 2014. According to Mechanics Local 701 Assistant Directing Business Representative Armando Arreola, members have shouldered increased out-of-pocket insurance premiums while only picking up 11 cents in wage increases in the last four years. Local 701 members at Superior Carriers work in tanker cleaning and maintenance.